Melfann's domain: Ambush - How True to their tagline of "Fast, Casual European Dining"? Ambush - How True to their tagline of "Fast, Casual European Dining"? 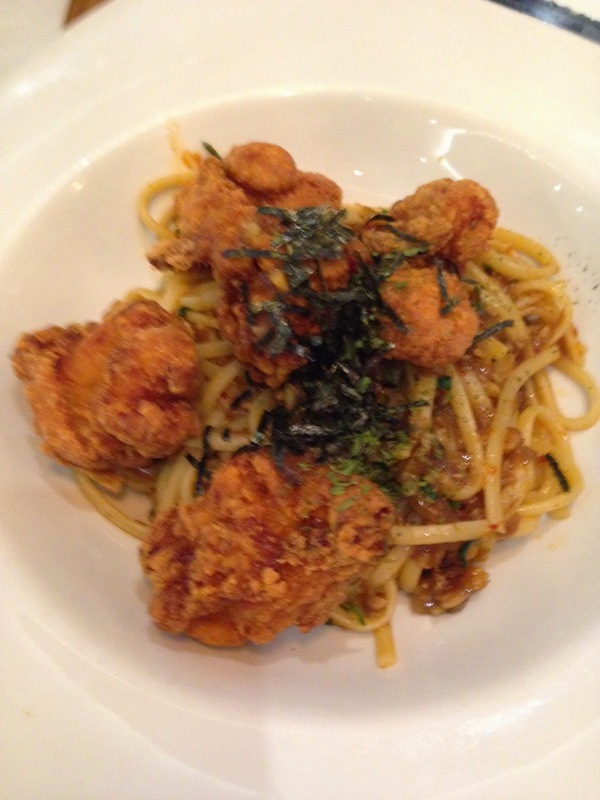 Having eaten Ambush's pasta at the basement of Takashimaya S.C., my overall impression of Ambush was that the food quality was quite reasonable especially for the price. As such, I was very happy to try the food at their Plaza Singapura branch as it offered choices from 5 main European cuisines - German, Belgium, Spanish, French and Italian. I like the simple decor, which fits their 'casual' theme, and I like how their menu is like a 6-page newsletter (for the graphic designers, it's a 6-pp folded to A4). Do note that this review is based on 3 separate experiences at Ambush (Plaza Singapura branch). The Duck Confit Salad (S$10.50++) was very very good and I highly recommend it especially if you're ordering a main that doesn't come with greens. The fact that the calamari (S$6.70++) comes with Thai Dipping Sauce is an indication that Ambush is not quite 'European' as it claims to be. 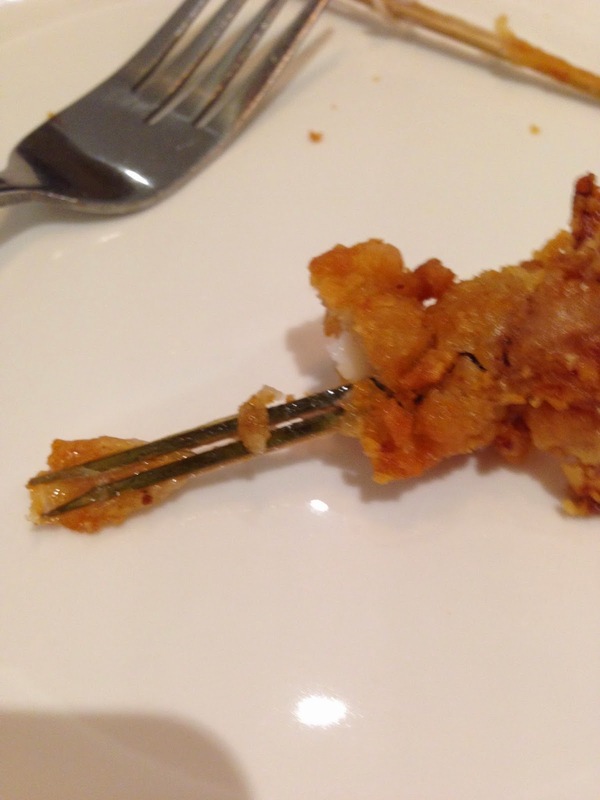 I wish they change the skewers used for the calamari because these 2 pronged ones look as if they can poke one's eyes out. Also, Ming and I had difficulty yanking the squid off! By the way, the dipping sauce was good. If you're sharing, I think the Oktoberfest Platter is a good place to start. The bangers are so-so and I felt that I could've gotten better ones from Cold Storage although Ming disagrees with me and loved the sausages. The schweinhaxn was cold but it was well seasoned. After this piece, I'm not sure whether I'd order the whole pork knuckle or not. The mashed potato was divine!! I didn't realise that there was sauerkraut because it was a very tiny amount hiding between the salad and mash. Not the best sauerkraut that I've eaten and where's the mustard to go along with the bangers? Side note: they definitely used very good balsamic vinegar in their salads because the taste was not very sharp and had a sweet undertone. The salmon was overcooked. The sauce for the pasta was ok. Don't understand that cream sauce on the salmon. Not too thrilled about this dish but I can see that many would order this as a safe option. Now, you MUST order the above (S$18++) and get it cooked with Au Vin and bacon. Basically, that's white wine and bacon. AND get it with the garlic bread to soak up the soup!! No fries and no mash. Just Bread. The garlic bread itself is good on its own but combined with the soup from the mussels/clams...ooh la la!! You might find yourself ordering more bread just so that you can eat it together with the soup. The chicken seaweed pasta is done aglio olio but with Ambush's twist. The result is a spicy pasta with the garlicky olive oil sauce that we all like but with coriander and possibly a bit of chicken juice. I can't really fault the pasta but I didn't think that it went well with the fried chicken and seaweed. The fried chicken was disappointingly uncrispy. When Ming saw this dish, he thought that I ordered the Duck Confit. No surprise there because it really does remind me of a confit rather than a rosti. I wonder whether the chef pan fried the chicken so that the skin would be crispy but there's a difference between roasted crispiness and fried crispiness. Another thing that disappointed and surprised me: the mushrooms were served cold. I didn't like the cream sauce either. It tasted as if nothing was done to the cream. Looks like if you want proper Poulet Rosti, you'd have to go to Poulet (the restaurant chain). 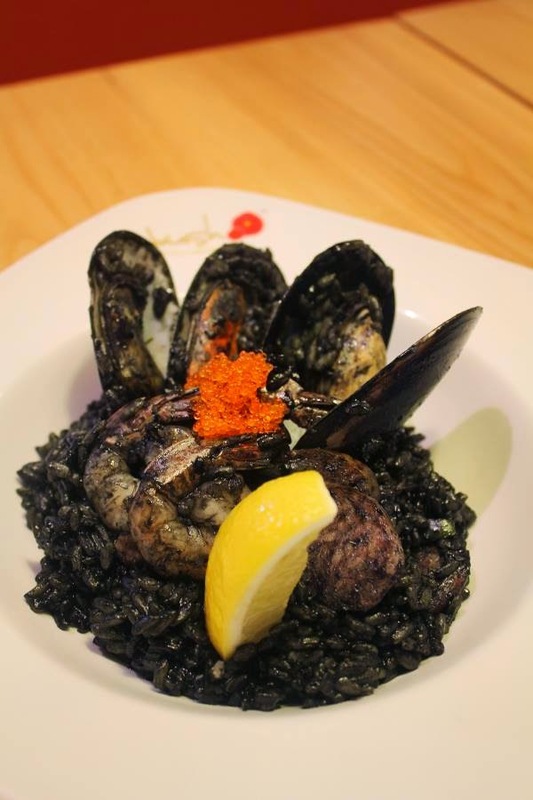 I do recommend their Negra Paella which is cooked in squid ink and served with succulent prawns, mussels and topped with tobiko. Again, this is Spanish with a bit of Asian twist. This was very delicious and it does not take that long to be served onto your table, unlike most other Spanish restaurants. By the way, I was so focused on eating that I had forgotten to take a photo so this photo has to be credited to Ambush's FB page. Drink-wise, I like their Honey Ginger Chai Latte as it's frothy and warm...perfect when you're seating underneath one of their air-con vents. I wanted to change the mesclun salad to a spinach base because I just wanted spinach (think iron). Immediate response was, "Uh...I'm not sure that can be done. You may need to pay the higher price (points to the Duck Confit Salad)." I always wonder...is it some knee jerk reaction to not stray away from the menu? Just check with the kitchen and the manager before coming back to me. Btw, there was no confirmation until the plate came. Yes, they changed it to spinach and charged me the higher price. Some confirmation would've been appreciated. My phone's battery died and I forgot to bring my phone cable although I had 2 power banks with me. So, I asked the waitress (same one as example 1 but this was on a different day) whether she or anybody else had an iPhone 5 charger cable. Immediate response was: "No...none of us have." Wow. I then replied rather sarcastically, "Oh...nobody? You mean everyone here uses a Samsung?" Guess what? She replied, "Yeah." Get real. The market share of Samsung is not 99%. I'm pretty sure someone has an iPhone. Moreover, she didn't even bother to ask around. That was so dismissive of her and honestly, that really changed my mood from good to irritated. So...when she went somewhere else, I asked one of the managers and he too replied with a "No...we don't charge for customers." to which I then said, "I'm not asking you to charge it for me. I've got chargers (show power banks). I just forgot to bring the cable. I'm asking for the cable." You could see the lightbulb light up in his head when he realised his earlier jump in conclusion was wrong. Thank goodness he replied with a "We don't have one but I'll ask our neighbour." Soon, he came with his cable (iPhone 4) and attached the iPhone 5 head onto it while explaining to me that he had to borrow that from someone else. I can understand why most shops wouldn't allow their customers to charge their phones within their premises using their electrical outlets but honestly, don't jump to conclusions first. Also, we've all been in that situation where your phone has died and it's really troublesome to be unreachable. It really does not hurt to be kind and lend an outlet or in this case, a cable. Karma will always come round. In the end, Ambush does deliver when it comes to speed but it's not authentic European cuisine as they have their Asian twists. Nonetheless, they do have some hits and misses. 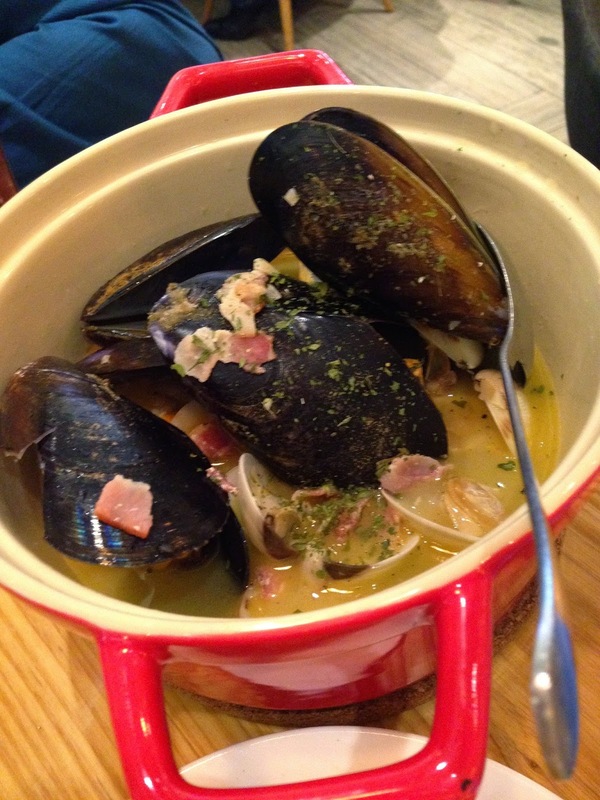 I'll definitely go back again just for the Clams Pot, Paella and Duck Confit Salad.